I don’t envy anybody working at Kings Cross Theatre having to find a way to market Puntila/Matti to a Sydney audience. Describing the experience of this wildly experimental but wildly entertaining show is no easy feat, as it defies easy categorisation and is full of wonderfully theatrical contradictions. 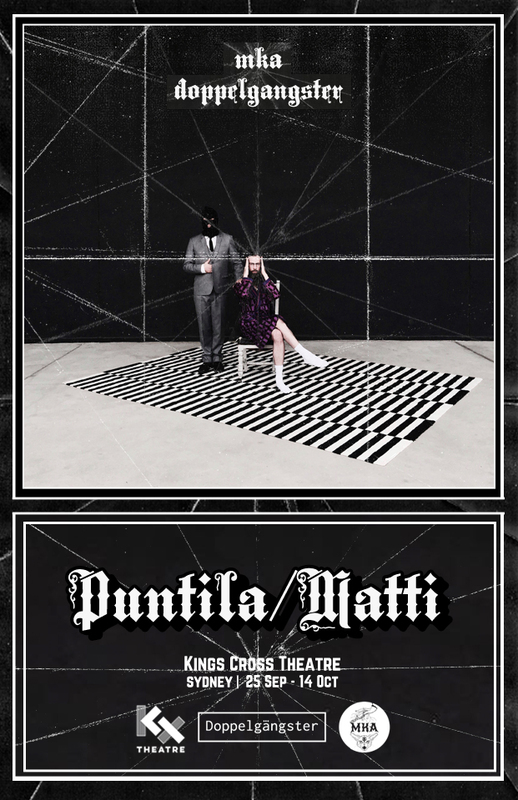 Puntila/Matti uses Bertolt Brecht’s 1940 play Mr Puntila and his Man Matti as its launchpad, taking audiences on a carnivalesque and frequently hilarious ride, blowing apart expectations about the theatrical form, and indicting capitalists along the way. The play comes to Sydney from Melbourne-based company MKA, in association with Doppelgangster. While MKA and its Artistic Director Tobias Manderson-Galvin have a solid following in Melbourne, Sydney audiences won’t quite know what to expect from his style. It’s quite unlike anything else seen in Sydney, where independent and fringe theatre tends to be a little more conventional in form. At its core, Brecht’s play is a story of the evolving relationship between a rich landowner, Mr Puntila, (Manderson-Galvin,who is also the co-creator and director of the work with Tom Payne) and his driver and servant Matti (Grace Lauer). Puntila is a drunkard who is by turns warm and doting, and then cruel and unforgiving to Matti. This version brings Puntila and Matti from 1920s Finland into Kings Cross in 2017. Puntila is still a capricious and arrogant pig, but Matti is now an Uber driver on permanent retainer. Somehow. But the way that story is told in this work constantly shifts and changes. Audience members are frequently pulled in to help construct the work, smashing through the fourth wall. Most of the play is performed by Manderson-Galvin and Grace Lauer relaying dialogue as heard through earphones, but there are moments where things go off-script to strong effect. To the side of the stage is set designer Antoinette Barboutis, who also performs as a kind of stage manager/narrator attempting to hold the self-destructing play together. She frequently threatens to steal the show with a quiet but side-splittingly funny performance of total incompetence. But it’s very much Manderson-Galvin who drives the performance, and is the audience’s guide to the play. He’s almost aggressively energetic, but has a great instinct when it comes to connecting with audiences, while never letting them slip into an easy sense of comfort. Grace Lauer, on the other hand, doesn’t have as many opportunities to speak directly to the audience, but provides a sense of stability among all the chaos. Manderson-Galvin and Payne’s play speaks clearly to the Marxist threads running through all of Brecht’s work, and particularly the take on capitalistic greed in the story of Puntila and Matti. Perhaps unsurprisingly, Puntila/Matti has proven quite divisive: it clearly delighted many at the performance I saw, but has had quite a few people walk out during previews. It’s Brechtian, but utterly contemporary, with dadaist touches. That means although it’s imbued with plenty of meaning, the meaning is deliberately inconsistent, sometimes hidden and obscured, but often blatantly clear. It’s the kind of theatre you need to let wash over you, and allow yourself to become lost in the language and rhythm. Certain audiences find it difficult to leave all expectations of what a particular performance might be at the door — and it would be fair to say that there are plenty of audience members like that in Sydney — but this play requires you to find joy and humour in its surprises, novelties, and sheer life-force. If you can do that, its rewards are immense.